Sometimes I build a column around an event. 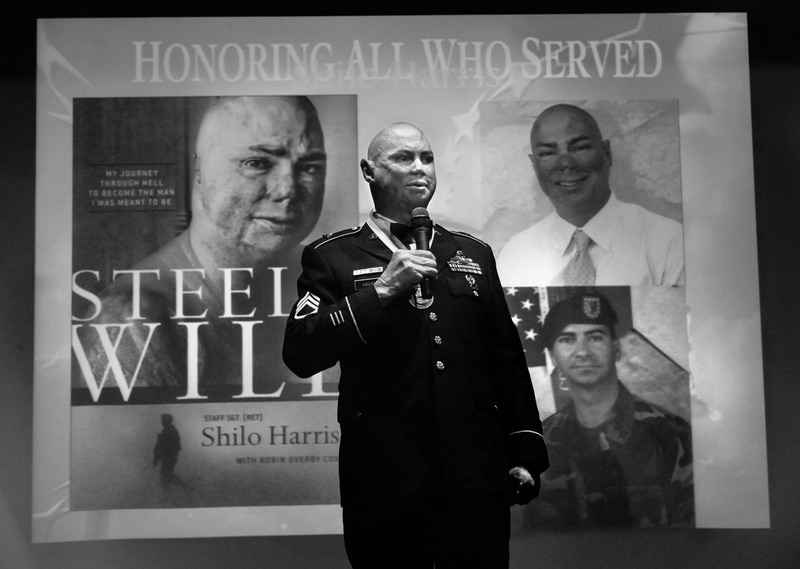 In this case, injured Iraq War veteran Shilo Harris visited Colorado City to promote his book and speak about his recovery. The task for me was to look beyond covering his visit as news by using words and pictures to give the reader a deeper sense of the man. This column ran Nov. 21, 2014 and was picked up by the Associated Press. 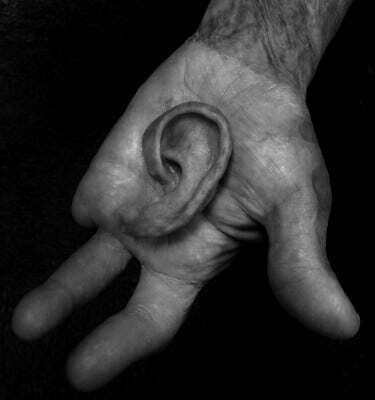 COLORADO CITY — To put people at ease, Shilo Harris pulls his ears off. It’s a small joke; a bit of humor to break the ice and allow those he meets the chance to see past the scars. Harris, 40, is a former Army soldier who was injured when his Humvee was struck by an improvised explosive device — how the military refers to homemade bombs — near Yusufiyah, Iraq, on February 19, 2007. The blast killed three men in the vehicle, all friends, and Harris received burns over much of his body. 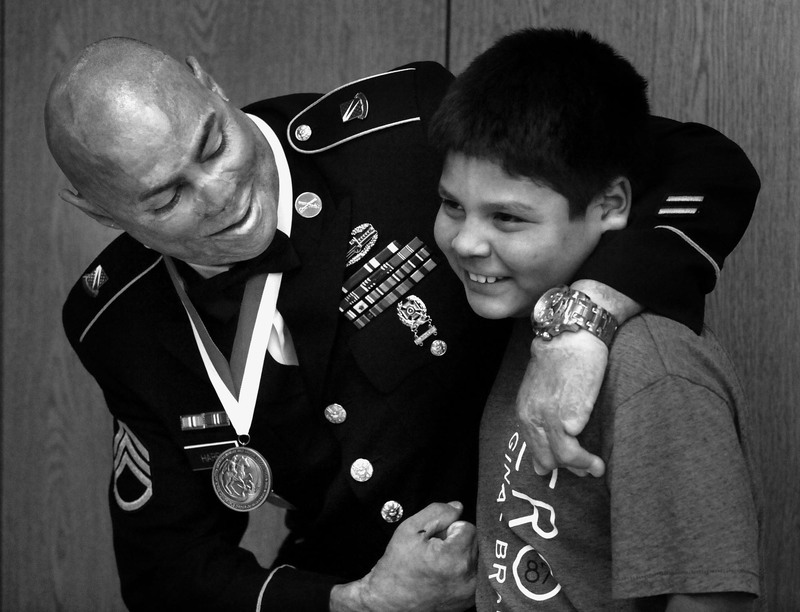 He details the events leading up to the attack and his recovery in a book he wrote with Robin Overby Cox, “Steel Will: My Journey through Hell to Become the Man I was Meant to Be.” Over the last month Harris has shared his story across the Big Country. The ears are purely cosmetic. Harris lost 60 percent of his hearing on one side and 40 percent on the other. The latex lobes attach magnetically to small posts embedded above holes where his ears used to be. It’s a little startling to see him casually yank one off and hand it to someone. A Texas native, he spent part of his childhood in Coleman. His mother Teresa Bentley, still lives there and was featured in the Reporter-News in a Labor Day story on the Owl Drug Store. 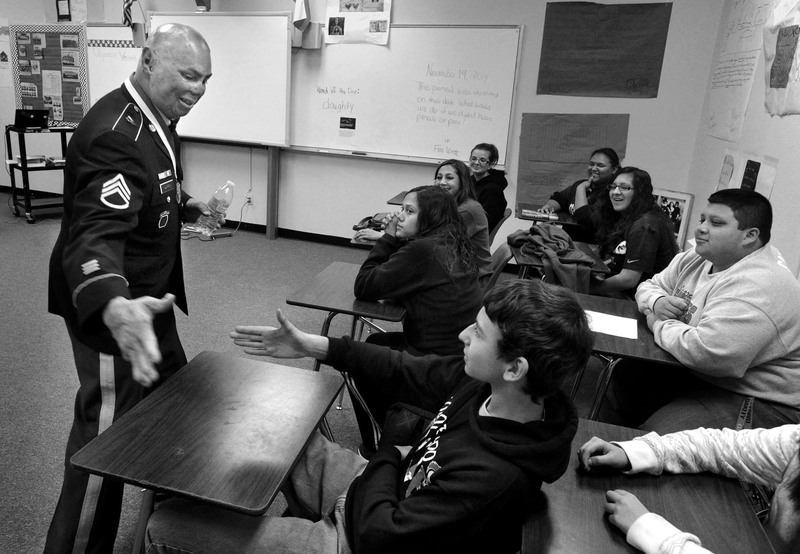 On Wednesday, Harris spoke at Colorado High School. A number of civic organizations, local businesses and private citizens sponsored his program. Students from Loraine, Colorado City and Westbrook attended, along with veterans from those communities. 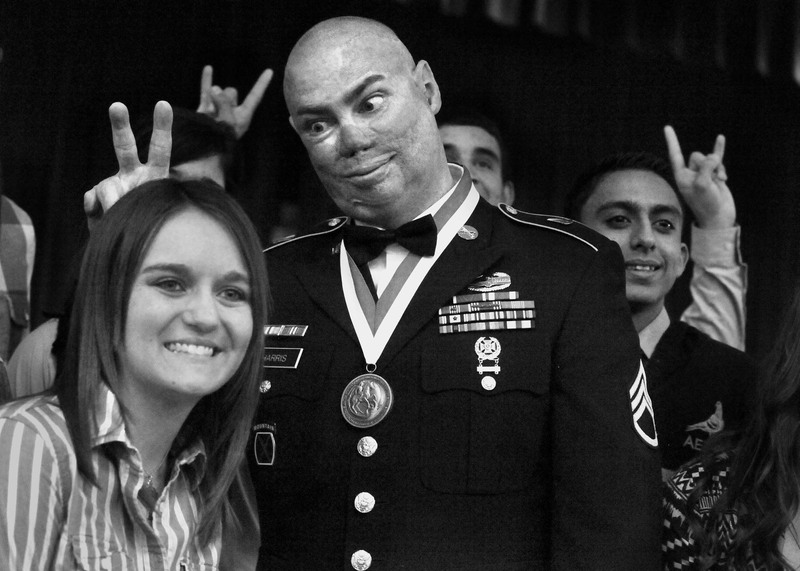 “Like many other veterans these days, I joined after 9/11/2001,” he said. He felt it was his duty to serve his community and nation after the terrorist attack. “We lost almost 4,000 lives in a matter of hours,” Harris said. Military service isn’t required to serve your country, he said. But doing so elevates people, and it brings serious responsibilities. 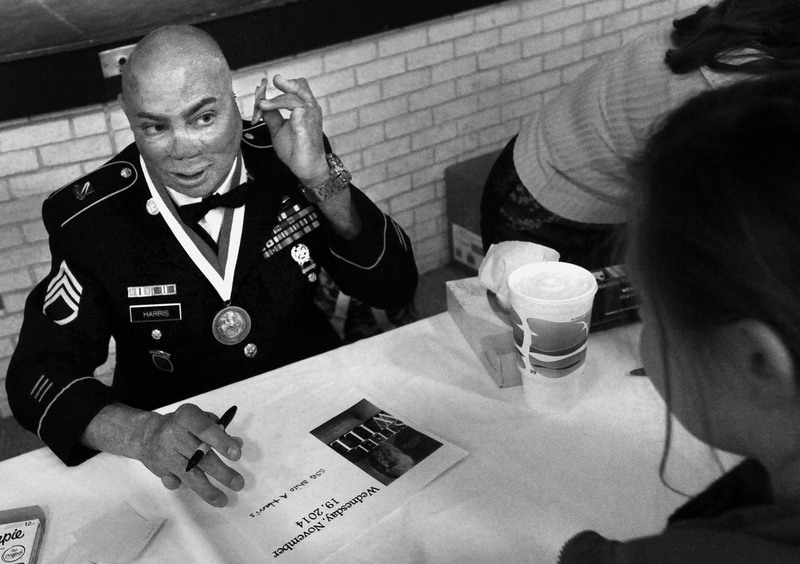 “It is the greatest honor there is, because when you sign your name on that line you’re saying I’m willing to die for what I believe in,” he told the audience. This was not lost on sophomore Kayla Browne. That afternoon, Harris visited her English class; the students were reading his book as group assignment. Her brother Austin had just finished Army boot camp. “If we were to have a war I don’t want anything to happen to him. Just knowing it’s possible, it kind of hurts me,” she said. Browne’s voice began to choke up. Seeing Harris and recalling photographs, war movies and combat video, she couldn’t stop herself from seeing her big brother in the same light. “Because anything is possible and it’s just not a good thought,” she said, tears beginning to fall from her cheeks. “I put his face on theirs and I can’t think of anything positive about it, because I just don’t want anything to happen to him. He didn’t mean to be a motivational speaker. Harris said he sort of walked into it. “I was lost in the hospital one day, I was pretty medicated at the time. I walked in a door and I was literally on stage,” he recalled. A group of men were sitting there. Whether they were doctors or chaplains, Harris didn’t know. It’s a must for Harris to balance the heaviness of his story with humor. Joking with visitors keeps the ice cracking, heading off any discomfort felt by his skin grafts or the remains of the seven fingers left on his hands. When posing for group photos, he’s the first to make a funny face or throw the bunny-ears hand sign behind whoever’s nearest. He’s long since made peace with seeing in the mirror a face different from the one he grew up with. There is a purpose in these programs. It reaches beyond patriotism, recognizing veterans or even selling books. 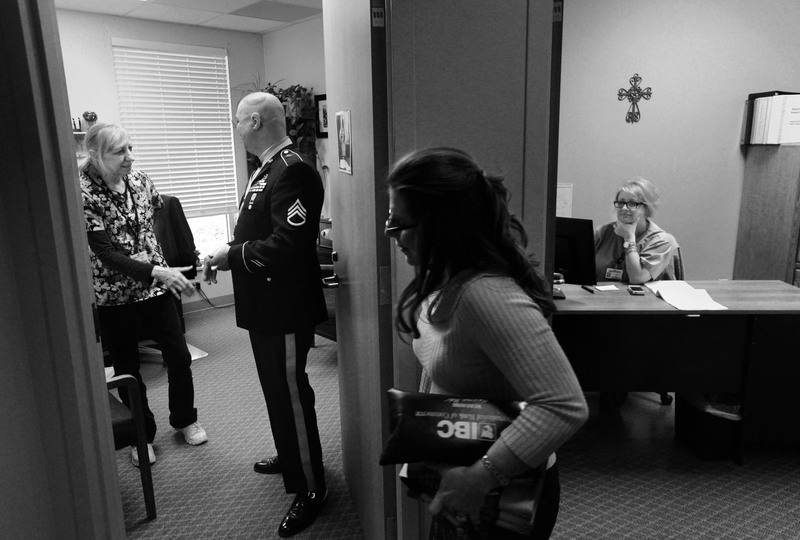 It lingers on a harrowing statistic he quoted throughout his visit, a national suicide rate of 22 veterans per day. But the purpose extends even beyond that. Harris’ message at its core boils down to one thing: Everyone has the strength to be more than they are. It takes faith and it takes courage, and it demands companionship. No one is alone, nor should they think they are. He has his wife, Kathreyn, and their five children to lean on. There have been hard times, to be sure. But with just a little faith, somehow the sun always manages to pierce dark clouds. It’s where the name of the book comes from and it’s a lesson anyone can learn. “I had to have the will to get up and do it each and every day,” he said. He wants the book to be a resource for veterans. When he and Cox began writing it he was clear from the start that being Christian doesn’t equate with weakness. 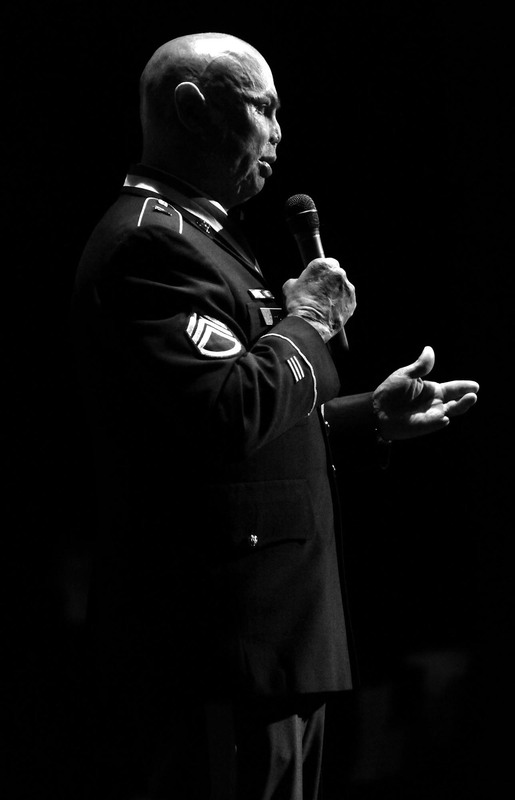 “I’m not Opie and this ain’t ‘The Andy Griffith Show.’ I’m Shilo Harris, I was raised hard, I served my country, I ate a lot of dirt, and I had a heck of a recovery,” he said.